The Cognitive Basis of Science. Edited by Peter Carruthers, Stephen Stich, and Michael Siegal, 422pp. (Cambridge University Press, 2002). The Cognitive Basis of Science concerns the question “What makes science possible?” Specifically, what features of the human mind and of human culture and cognitive development permit and facilitate the conduct of science? The essays in this volume address these questions, which are inherently interdisciplinary, requiring co-operation between philosophers, psychologists and others in the social and cognitive sciences. They concern the cognitive, social, and motivational underpinnings of scientific reasoning in children and lay persons as well as in professional scientists. The editors’ introduction lays out the background to the debates, and the volume includes a consolidated bibliography that will be a valuable reference resource for all those interested in this area. The volume will be of great importance to all researchers and students interested in the philosophy or psychology of scientific reasoning, as well as those, more generally, who are interested in the nature of the human mind. (from the back cover). Peter Carruthers, Stephen Stich, and Michael Siegal. Introduction. Steven Mithen. Human evolution and the cognitive basis of science. Scott Atran. An experimental approach to the cognitive basis of science: universal and cultural factors in biological understanding. Peter Carruthers. The roots of scientific reasoning: infancy, modularity, and the art of tracking. Alison Gopnik and Clark Glymour. Causal maps and Bayes nets: a cognitive and computational account of theory-formation. Nancy Nersessian. 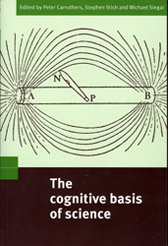 The cognitive basis of model based reasoning in science. Rosemary Varley. Science without grammar: scientific reasoning in a severe a-grammatic aphasia. Barbara Koslowski and Stephanie Thompson. Theorizing is important, and collateral information constrains how well it is done. Jonathan St B T Evans. The influence of prior belief on scientific thinking. Denis Hilton. Commonsense and scientific thinking about causality: cognitive and social bases of reasoning. Kevin Dunbar. Inside the scientific mind: scientists' cognition in Vivo. Christopher Hookway. Emotion and epistemic virtue. Paul Thagard. The Passionate scientist: emotion in scientific cognition. Philip Kitcher. Social psychology and the theory of science. Ronald Giere. Scientific cognition as distributed cognition. Michael Siegal. The science of childhood. Paul Harris. What do children learn from testimony? Luc Faucher, Ron Mallon, Daniel Nazer, Shaun Nichols, Aaron Ruby, Stephen Stich, and Jonathan Weinberg. The baby in the lab-coat: Why child development is an inadequate model for understanding the development of science.